Ahmadinejad: "I believe in maximum freedom of expression"
TEHRAN, Iran (CNN) -- The online networking sites Facebook and Twitter were back in business for Iranians Tuesday, a day after the government banned the country's access to them, a freelance writer said. 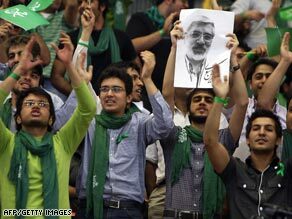 Opponents of Mahmoud Ahmadinejad like Mir Hossein Mousavi are using technology to reach voters. The 28-year-old woman, who uses the name Shahrazad to protect her identity, said the sites were reactivated during the morning. On Monday, CNN Correspondent Reza Sayah asked Iranian President Mahmoud Ahmadinejad about the shutdown of Facebook. He told the news conference he had not called for the ban but would look into it. He added, "I believe in maximum freedom of expression." After the briefing, access to Facebook was reinstated, but that ended a few hours later and the block remained in place until Tuesday morning. No reason was given for the block. Shahrazad, who has been blogging for eight years, said Twitter also was affected. She maintains an English-language blog on WordPress in which she discusses Iranian and world issues and topics related to women. The writer, who lives in Tehran, spoke to CNN via a computer voice system. She seemed unconcerned about the Web site restrictions, and said she doubts most Iranians were affected. Twitter and Facebook are used by students or journalists, she said. Many Iranians don't use the Internet at all, she added. The semi-official Iranian Labor News Agency reported over the weekend that the government had blocked Facebook amid political jockeying for the June 12 presidential election. Reformist candidate Mir Hossein Mousavi -- a former prime minister considered a threat to Ahmadinejad -- has created a Facebook page for his campaign and has more than 5,000 supporters on the site. Those attempting to visit Facebook received a message in Farsi saying, "Access to this site is not possible," according to CNN personnel in Tehran. The news agency reported that the Masadiq Committee, made up of representatives from Iran's intelligence ministry, judiciary and others, had ordered the action. After a few hours, the blockage was lifted, but was then reinstated, the agency said. "I personally think that sometimes people use very bad language when they are campaigning," Shahrazad said. Any kind of behavior that is insulting is "unacceptable" in Iran. It is not unusual for the Iranian government to monitor and filter blogs -- taking action against anything it considers offensive, she said. Facebook issued a statement on Monday after hearing about the Iranian restrictions. "We are disappointed to learn of reports that users in Iran may not have access to Facebook, especially at a time when voters are turning to the Internet as a source of information about election candidates and their positions," a Facebook representative said in a written statement. "We are investigating these reports. Iran's population, which the CIA World Factbook estimated at more than 66 million by July 2009, has a median age of 27. The Financial Times newspaper, which has put the country's population at 70 million, said 47 million Iranians have cell phones and 21 million have Internet access. -- CNN's Octavia Nasr contributed to this report.